Times are changing fast. Mobile devices have become an integral part of our life. Imagine you are sitting with your friends at a farmhouse that is 60 minutes away from the nearest McDonalds food joint. Suddenely, you and your friends make a plan to eat some burgers at McDonalds. In the normal scenario, you will drive to the joint and order the burgers after reaching there. This will take 60 minutes to drive and 40 minutes to place an order. Hence, total time taken would be around 100 minutes. The new Google patent lets you reduce the ordering time by atleast 30 minutes if we take the above example. Amazed? How was that made possible? Google will allow you to order from your favorite restaurant using your mobile device and also alert the manager when you are about to reach the restaurant so that your order is delivered at a minimal time delay. This will save a lot of time. In order to streamline the flow of transactions between the consumer and the merchants, a mobile device can be used to order ahead. The consumers mobile device will send the order to the merchant's network device. The merchant device will receive a preparation time for the order and then it will determine the location of the user device. A comparison will then be made between the projected time of arrival and the total preparation time. The device will notify the merchant when preparation time equals the arrival time. This way a whole lot of time would be saved providing ease to both the consumer and the merchant. Step 1: User opens ordering application on the mobile device. Step 2: User selects preferred merchant and places an order. Step 3: Order gets transferred to the merchant device and payment transaction is processed. 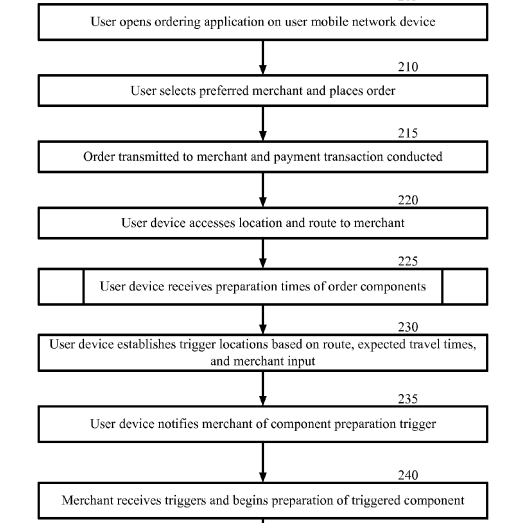 Step 4: User device tracks location of the merchant and receives preparation time of order components. Step 5: User devices establishes trigger locations based on route. Step 6: User devices notifies merchant of component preparation trigger. Step 7: Merchant receives component trigger and starts preparing the order components.